If you're paying attention, you'll have noticed a new album from Mounira Mitchala atop this month's Top 10 chart. It's been five years since the Chad-born singer released an album, the last being the tasty Talou Lena in 2008. The new album, Chili Houritki, brings us a unique form of Afropop strongly rooted in Chadian rhythms and melodies including n’gandja, guissesse, kidi kotoko, meund, kidi gourane, klaguu, nielim, gourna toupouri, mbong, toumtoum, and gourna. I'll be honest; my knowledge of Chad's music is paltry, in part because so little of it escapes the central African nation's borders to reach a worldwide audience. "It’s true that very few artists from my homeland are known abroad," Mounira says, "but there’s just so much musical talent around in Chad! Even women are beginning to play more and more of an active role!" 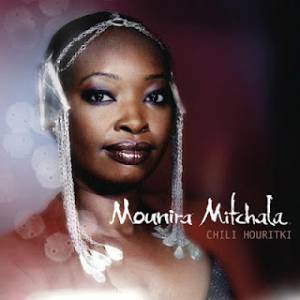 If the rarity of Chadian music makes this album special, it's the crisply recorded, well-arranged songs led by Mitchala's powerful voice that pushes it onto our playlists and atop the July Top 10. Check out this song from the album, which is based on the Saï rhythm. Mitchala incorporates beats and lyrics from Chad's different ethnic groups in order to be understood across the nation, and as a way to work for national peace and unity. In a 2008 interview, she said: "I was born in 1979 when my country was already at war… I can tell you that war is completely and utterly terrible. I saw it firsthand with my own eyes. It’s only when we get peace in my homeland that we’ll be able to start building for the future."